be a sewing machine and like most gadgets these days there are so many to choose from. Here I’m going to give you some tips on choosing a sewing machine and I’ll gradually add reviews to help you make an informed choice. Remember, now is a perfect time to start dropping hints about your Christmas present! First of all you need to ask some questions. You want to get the best you can for your budget and this doesn’t always mean one with lots of features but a machine that’s made with quality parts. Prices range from as little as £50 up into the thousands. A £50 machine will do the basics, straight stitch, zig zag and reverse and probably won’t be of great quality but if you’re on a tight budget it will do the job for occasional use. I have a friend who recently purchased a £50 machine (review here), she only wants to do the occasional alteration so her clothes fit better and small simple items. She is a complete novice and this machine was very simple to use so perfect for the job. The next level will be a better quality machine with a few more features like automatic buttonholes and then onto features like embroidery stitches and quilting capabilities. Keep going up in price and you get into the computerised range which will have lots of stitch options, a memory (like your pc!) being able to fill the bobbin without removing it, the list goes on. Remember though, the more features the more complex the instructions. You can also consider a second hand machine, I have a trusty old Bernina which I picked up at an auction house for a few £, guess there weren’t many sewers in there that night! The downside to these vintage machines is their weight, they are HEAVY something to take into consideration! Take into account the cost of taking it to a reputable agent to get it serviced and the electrics checked over. I’ve recently started quilting so will be looking at machines with features like a large throat space and the ability to drop the feed dogs. I do like to use fancy stitches like on this bookmark and have neat button holes. If I had the budget I’d go for a top of the range computerised model, but wouldn’t we all! 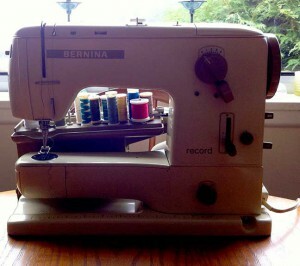 At the moment I use the old Bernina and the Brother overlocker (reviewed here) but I do have other machines I bring out depending on what I’m making. If you’re planning on taking up quilting then you need to invest considerably more for something that does the job well. This one Janome XL601 Sewing Machine is at the low budget end but has some decent reviews. and at the top end and definitely on my wish list is this super deal! Pfaff Quilt Expression 4.0 IDT. GUR Limited Offer £1,099. Includes FREE Quilt Fabrics & Gold Pack. While Stocks Last. 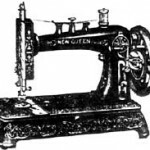 Lastly, do the research, don’t get taken in by sales talk when choosing a sewing machine, keep in mind the bullet points above and feel free to contact me for advice.